The announcement by Caltech astronomers of evidence of a giant planet lurking in the outskirts of the solar system has re-ignited the discussion about the existence of planets beyond Neptune. We could be on the verge of confirming the presence of a hypothetical 'Planet Nine' and NASA's New Horizons spacecraft, our messenger to Pluto and trans-Neptunian objects, might have the final word in this debate. New Horizons was launched in January 2006 and made its closest approach to Pluto on July 14, 2015. After the successful encounter with this dwarf planet, the probe entered next phase of its mission to study icy celestial bodies beyond Neptune's orbit called Kuiper belt objects (KBOs). Thus, it's the right time to make use of New Horizons to hunt for possible planets in this area. A study conducted by an Italian scientist before New Horizons' encounter with Pluto lays out perspectives of finding the location of massive objects by employing the spacecraft's capabilities. Lorenzo Iorio of the Italian Ministry of Education, Universities and Research, argues that radio tracking apparatus aboard New Horizons should be able to detect hypothetical planets hiding at the fringes of our solar system. A research paper detailing his study was published on Jan. 29 on the arXiv pre-print server. New Horizons is equipped in the Radio Science Experiment (REX), an uplink radio science instrument with radiometer capabilities. It was designed to study surface conditions on Pluto—in particular, atmospheric temperature and pressure. Iorio suggests that REX could be also used for accurate radio tracking of anthropogenic objects beyond solar system's outermost planet. The fact that the spacecraft is spin stabilized should help these observations and measurements. The location of a possible unknown planet can be indirectly derived from its putative gravitational pull on known objects in our solar system. According to Iorio's research, New Horizons should be capable of range accuracy of 33 feet (10 meters) over distances up to 50 AU (astronomical units; one AU is equivalent to approximately 93 million miles or 150 million kilometers). "This should allow to effectively constrain the location of a putative trans-Plutonian massive object, (…) whose existence has recently been postulated for a variety of reasons connected with, e.g., the architecture of the Kuiper belt and the cometary flux from the Oort cloud," the paper reads. Iorio's computations suggest that New Horizons would be capable of detecting an Earth-sized rock-ice planetoid at some 100 to 200 AU, as it would impact the range of the spacecraft at a kilometer level. The same goes with a Jovian mass planet at 10,000 to 20,000 AU, which should be easily detectable by the REX instrument. There is also a possibility of detecting a possible planet directly from its emitted electromagnetic radiation, either in the visible or in the infrared. However, as the author of the paper concludes, imaging such distant bodies would be quite difficult for New Horizons with present-day technology. 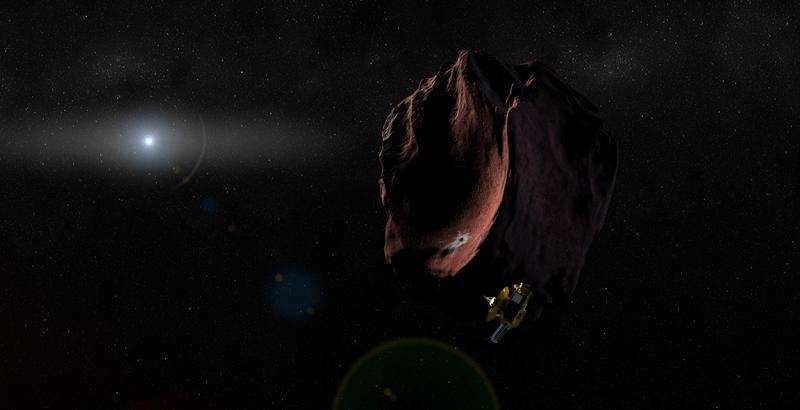 New Horizons is currently on course for a close flyby with a KBO designated 2014 MU69, located about a billion miles farther from the sun than Pluto. It should arrive there on Jan. 1, 2019. This long and demanding journey could be a great opportunity for the spacecraft to search for the hypothetical 'Planet Nine' by keeping its scientific ears and eyes open.